Want to make it so that every closet, cabinet, cupboard, and pantry in your home lights up anytime you open the door? URPOWER Motion Sensor Lights are the answer. These little puppies are surprisingly bright for their size and they automatically shut off after 20 to 30 seconds go by with no motion detected. 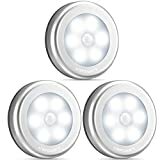 They have a 10-foot range for motion detection so you can also use them to illuminate hallways, stairs, or entryways, and they’re on sale right now on Amazon so a 3-pack only costs $13.99.